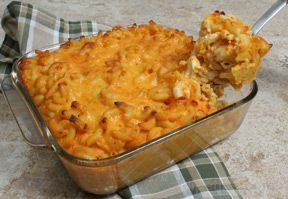 Just because "healthy" is used in the name of this macaroni and cheese recipe, it doesn't mean that it doesn't taste good. Once you've tried this unusual version featuring, of all things, sweet potatoes, you'll agree that it's fantastic! Combine the sweet potoates, stock and milk in a medium saucepan and bring to a boil over medium-high heat. Reduce heat to medium and simmer until the sweet potatoes are tender, approximately 15 minutes. Remove from the heat and mash them in the pan with the milk, pepper and salt. Bring a large pot of water to a boil. Add in the chicken flavored seasoning and noodles. Cook until al dente. Drain and pour into a large bowl. Add in the mashed sweet potoates, cheddar cheese and cream cheese. Lightly coat the baking pan with non-stick cooking spray. Pour the noodle mixture into the pan. Cover with aluminum foil and bake for 20 minutes, then uncover the dish and continue to bake for 30-40 minutes longer.